Dr. Suzy Ryan believes in a holistic approach when working with her patients and their families. Her deep commitment to them is evidenced not only by her medical expertise, but the time she takes to listen and the comprehensive care she gives them. She believes in the integration of Western and Eastern veterinary practices and given this proclivity, she is a graduate of the Chi Institute in Florida. Susan presently lives in Park Slope with her two rescue cats, Sophie and Shrimpy. She enjoys walks in Prospect Park and biking around the neighborhood. Susan loves gardening and can also can be found walking dogs for Sean Casey. BluePearl Brooklyn veterinary hospital is available to treat your pet’s needs 24 hours a day, every day of the year. They are here for you in an emergency or if your family vet’s office is closed. Veterinary Emergency and Referral Group (VERG) Open 24 hours, 7 days a week, our emergency/critical care units consist of teams of experienced and dedicated emergency doctors, technicians, and assistants working together to provide the highest quality care. Dharma Dog NYC knows many amazing dog walkers for various neighborhoods. Here is our list of the ones we love! 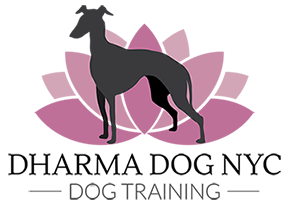 Canine Running Co. is a down to earth and professional Brooklyn based dog running service providing stellar quality of care for your dog. They go the extra mile to help your dog get the exercise they love and need, all year round. They offer personalized one-on-one runs that allow your dog to obtain maximum benefits. They provide flexible hours with multiple service options to suit your needs and are experienced and comfortable handling dogs of all sizes and temperaments. Plus, after every run you'll receive a PUP-date including pictures and video! Let a passionate and experienced dog runner take your dog out for a run today! Your dog will thank you! Brought to you by the dedicated folks behind the locally loved pet care company Ditmas Paws, a new multi-service pet facility located in Flatbush-Ditmas Park is here to accommodate your dog’s needs.